We call it “Custom Rope” because we have the knowledge and ability to make a rope to meet your individual needs. We take pride in being able to serve you and give you the best product the market has to offer in respect to safety, braiding techniques and warranty. 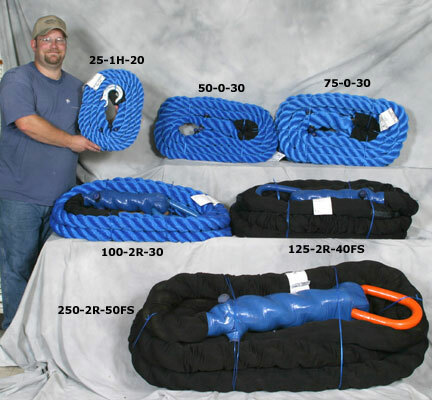 We look from day to day for ways to improve our product and feel we have developed and perfected “Custom Rope” to be the best tow rope on the market. Look for these qualities only found in “Custom Rope”. SAFER THAN NYLON, CABLE OR CHAINS! In the past, people have used nylon, different types of polypropylene, cable and chain but non of these were originally designed for towing. “Custom Rope” is designed for the sole purpose of pulling. It is a safer rope and one that is more durable and resistant to the many different elements that a farmer, a man in the oil field, or a man in construction would be exposed to. Weather, battery acid, diesel fuel, oil, gasoline, hydraulic fluid, fertilizer; all of which damage nylon, will not harm our polypropylene ropes. Many companies try to compete with our prices and have copied our size structure. When compared, ours has been found to be the heavier and the stronger rope per labeled size and length. (Other ropes boast to be the same lengths, but when purchased and unrolled for use, they are most often found to be 3 to 6 feet shorter than labeled). “Custom Rope” has more twine; and therefore, has much more strength. It is more UV stable and does not deteriorate in sunlight. We do not make a white polypropylene rope, so as not to be mistaken for nylon (because of the fear associated with nylon due to the many accidents involving nylon rope) and again because white is not UV stable. Our polypropylene “Custom Rope” only stretches 10-14% of its length. You must have a certain amount of stretch to obtain the use of kinetic energy; but you don’t need so much that the rope becomes dangerous. If the “Custom Rope” should break, it does not have the dangerous recoil that nylon has. This is because the use of the bonded monofilament-type twine keeps the twine separated within the rope itself-this keeps the rope cooler under tension and it won’t have the friction problems that other ropes have. This allows the rope to break down at the weakest point of each individual trend, setting up a chain reaction and the rope will more or less come apart and recoil below the hooking point. The way the loops are braided gives “Custom Rope” approximately 20% more strength in the loops, because the rope cannot cut itself in the braid. In a normal “navy” braid, the strands go over and under each other and will cut each other under tension. Our new braid lays around each strand, and never crosses itself, which gives it more strength under tension. This rope is unparalleled in quality. Almost any configuration of sizes, lengths and options are available. Full sleeves are also available to help protect the rope. The ropes listed above are considered normal stock. Any rope is available “Custom” made generally in a few business days.